Limited time only. Reservations accepted. Dine in only. Consistently popular since 1985, our seafood restaurant and market provides the highest quality seasonal dishes using fresh seafood & produce with an outstanding wine list & extensive liquor & beer selection. The dining ambiance is pleasantly casual and intimate. Fresh catches are flown in daily from all parts of the country. We have a full service fresh seafood market for those customers that love creating their own seafood masterpieces. From saltwater exotics to freshwater favorites, the selection is the most varied in Denver. Buying wholesale provides us the opportunity to keep our menu and retail market prices affordable. Lunch is served Monday through Saturday from 11:00 AM to 4:00 PM. All entrees served with creamy coleslaw and/or appropriate accompaniment. Spicy Thai chili-orange sauce with scallions, cucumber and cilantro. Served over rice. Broiled in butter & Chablis with Italian bread crumbs, served with tartar sauce. Dinner is served Monday through Saturday from 4:00 PM to Close. All entrees served with a dinner salad, house bread and appropriate accompaniments. All specialty items served with a dinner salad, house bread and appropriate accompaniments. Corn tortillas stuffed with Maine lobster, Canadian crab and spicy Monterey Jack cheese. Topped with a jalapeno cream sauce....Chef's Specialty! A GOURMET MEAL FOR TWO IN 25 MINUTES! Cherry Crest Seafood Restaurant and Market is known around the Denver area for its take out specialties. The New England Style Gourmet Steamer pot is a definite favorite. Give us a call and place an order to go today! This complete gourmet bucket is layered in seaweed and ready to steam! Quick and easy to prepare! Ask your server! Live Maine Lobsters also available. Call us at 303-798-2600 to place your order. Please call (303) 798 - 2600 to make a reservation! Parties of all sizes welcomed! Cherry Crest Seafood Restaurant and Market is a HAACP approved and inspected retail supplier serving the south Denver area including Littleton and Englewood. The same fresh seafood served on our menu is available in our retail market case. Our Seafood Market is open Monday through Saturday from 11:00 AM to Close. Call us at 303.798.2600 for availability and market prices. 8 LB. WHOLE MAINE LOBSTER! Zagat Food Review: "Who would've suspected that a fish take-out spot and neighborhood market would have such fin fare?" ponder smitten surveyors about this Littleton seafooder where the "fresh", "fast, tasty", "unpretentious eats", "little atmosphere", and "sassy waitresses" ad up to a "bargain meal"." Denver Post: "The Cherry Crest goes beyond the usual salmon, red snapper, and swordfish to include carious shark steaks, mahi mahi, sole, and even the elusive pompano one recent evening. But what's perhaps best about the place is what isn't done to the fish. The items I sampled weren't overcooked, drowned in sauces or laced with too many spices. Grilled fillets arrived firm, juicy and topped with touches of herbs, citrus relishes, lemon and butter." 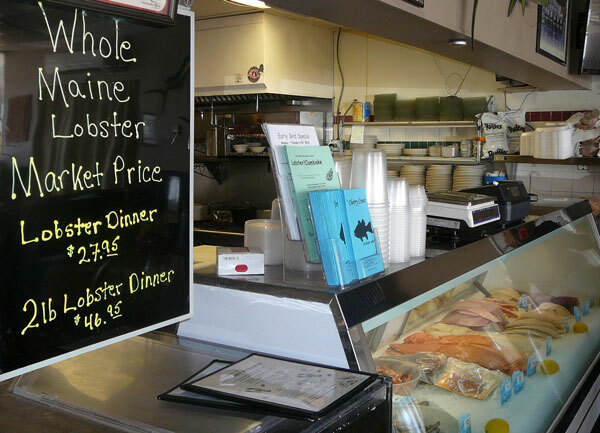 Denver Post: "...they have a huge menu with a whole range of fish, shellfish, and crustaceans in various preparations. The menu pegged the enchiladas as the chef's specialty. Turns out they made for an excellent dish, with succulent chunks of lobster, sweet crabmeat, delicate tortillas, and a creamy, dusty-spice sauce. I loved every bite, and woke up the next morning craving more." WestWord - (Voted Best Seafood Lunch): "If you're truly out to lunch, you may as well go fishing. Figuratively, that is--and if it's fish you want, Cherry Crest is a reliable place to get it fresh without lifting a rod. 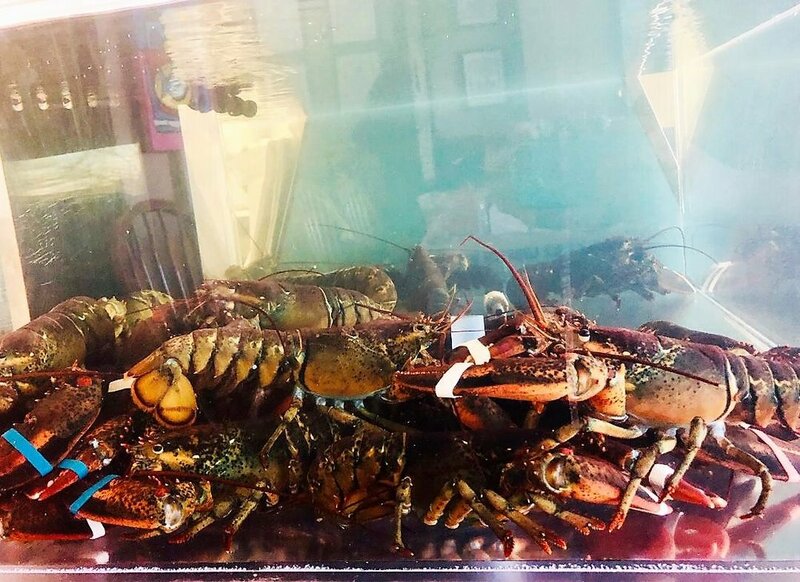 No need to feel landlocked here--along with a selection of complete-meal specials, the busy Littleton restaurant also serves lighter midday fare--lobster rolls, seafood salads, and smoked salmon on toast." The Restaurant Show - (Warren Byrne): "It's not the fanciest place in town, but you'll be hard-pressed to find better seafood anywhere."